Pull out all the contents of the closet or cupboard you're working on. Evaluate each item with an critical eye. If you haven't worn it or used it in a year, out it goes. Pack up what you can for donation. You may even be able to make a few dollars by selling items on eBay or at a consignment shop. Take this opportunity to thoroughly clean the cupboard or closet.As you replace the contents, organize them based on like items and frequency of usage. For instance, the linen closet should have sheets and bath towels front and center. Beach towels, winter blankets and other seasonal items should be up top or towards the back. A whole industry has grown around accessories to help you make use of every inch of closet and cabinet space. Space bags use compressed air to condense sweaters, comforters and other bulky items to a fraction of their full size. Clear plastic stacking bins let you see what's inside for easy access. Over-the-door organizers for cupboards and closets take advantage of vertical space that's otherwise wasted. Sites like Pinterest are a great resource for ideas. Now that all your closets and cupboards are beautifully organized, you might think you've reached full capacity. The good news is that you can literally create additional storage by putting furniture to work pulling double duty. Here are a few ideas to get you started. Add a stylish ottoman that opens up to reveal a hidden compartment. Store blankets and throw pillows in a vintage trunk that serves as a coffee table. Replace a couple of dining room chairs with a bench seat that holds table linens or cookbooks. Top a storage cubicle with a cushion for a charming window seat. 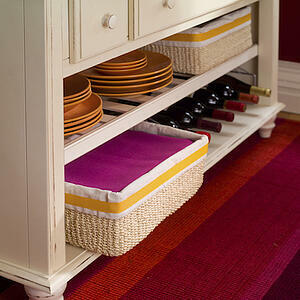 Place baskets inside the cubbyholes for pull-out convenience. Eventually your eye will become trained to spot all kinds of opportunities. Storage space in your apartment can grow as large as your imagination takes it. Do you have a favorite go-to trick for increasing storage? Share it with us in the comments!